What is a Direct Vent Fireplace and What to Look for When Shopping? This entry was posted in Fireplaces on February 4, 2019 by The Original Flame Author. Have you always desired a warm and comforting living space? Do you love houses that have a fireplace where you can see a vibrant dancing flame and enjoy the crackling of the logs? Well, in that case, there is no reason why you shouldn’t have a fireplace in your own home. Many Canadian houses do not have fireplaces as they lack the provision to incorporate a traditional fireplace with a chimney. However, today you do not need to remodel and renovate your entire living room for a fireplace. You can simply search for a direct vent fireplace design that is suitable for your space and enjoy the warmth you have always desired. Read on to know more about a direct vent fireplace. Direct Vent Fireplace – What is it? A direct vent fireplace is a fireplace that has been designed specifically to function without a chimney, unlike the traditionally vented fireplaces. These fireplaces feature a combustion chamber that is completely sealed, allowing It to vent directly through a side wall of the house, or through the roof if necessary. Many people shy away from installing fireplaces in their home as they do not want to bear the high cost of installing a fireplace. With a direct vent fireplace, there is no requirement for many renovations and the cost of installing these fireplaces is comparatively lower. They also offer ease of installation as there is no need for any additional foundation or masonry work, all you need to do is find a spot for the vent pipes to pass without trouble. Further, our experts will be able to suggest the best and the easiest way of installing the fireplace in your living space and make the most of it. Direct Vent fireplaces are available in many styles with different heating options enabling you to choose the one that goes best with your living room. Sealed combustion is probably the biggest advantage that is offered by direct vent places. Especially if you or your family members suffer from respiratory issues, then this is the fireplace you have been looking for. 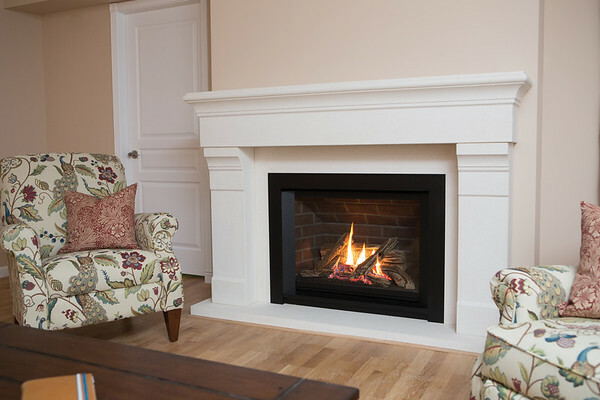 Direct Vent fireplaces take all the gases produced during combustion and pull it outside. Since all the gases are vented outdoors, it promotes a high quality of the air indoors. Being entirely sealed, the air used in burning venting is also taken from outdoors by the combustion chamber. This ensures that the people in the house do not have to deal with smoke and do not breathe in any harmful gases like carbon monoxide. Direct Vent fireplaces are shaping how the future of fireplaces are going to look. Offering the ease of installation and cost-effective yet efficient heating, they have become a favourite among many. A direct vent fireplace will also offer you flexibility in terms of design and style, allowing you to create a beautiful and contemporary living space. The Dimensions – Direct vent fireplaces are available in a range of shapes and sizes, ranging from the common square or rectangular to long linear and three-sided fireplaces. When selecting a fireplace, you will have to properly measure the part of the house you want to have the fireplace and then look for a fireplace that meets the dimension requirements. You can decide the shape and style of the fireplace based on the installation you have in mind. Venting Position – Another factor that needs to be evaluated is the venting position. If you are installing on an outside wall you will vent through the wall. If you choose a room in the middle of your homeMost fireplaces offer a top or rear venting option. If you wish to install the fireplace against a wall, you should opt for a rear-venting fireplace. If not, you should go for a top-venting fireplace where the venting material is installed through the roof. If you are installing a direct vent in the basement you will need ground clearance for the exhaust pipe to be installed above ground level. Heat Output and Ignition Types – The heat output is an important aspect that you should evaluate before buying any non-wood-burning fireplace. Determine the size of the room or area that the fireplace will go in. A couple of questions to ask yourself are: Do I just want to warm up the area or am I looking to get as much heat as possible? Installing a big BTU heater in an area that doesn’t require a lot of heat means that you will always be turning the fireplace off because it will be too hot! We can help you size the heat output for your comfort. There are large fireplaces that put out small amounts of heat. Have an idea of the general physical size of the fireplace that will suit your space aesthetically. There are two general ignition types, standing pilot and intermittent pilot, both work well. In the colder climates, the intermittent pilots have a switch to turn them into continuous pilot as the pilot light keeps the venting warm. Both will work in a power failure but the intermittent pilot system you will need to put batteries into the backup when the power goes out. Final Words – Should You Buy It? Direct vent fireplaces represent the best of what technology can offer in the fireplace industry. These fireplaces will transform your home into a warm living space, guaranteeing safety and efficiency at the same time. If you are looking to install a fireplace in your home, without undertaking any major renovations, you should definitely get a direct vent fireplace! At the Original Flame, we stock all types of fireplaces and provide professional installations too. If you are having trouble selecting your fireplace, visit us and we will be happy to guide you through the process.